The period after delivery (postpartum period) can become a nightmare in terms of fashion for females. You are not back into shape to fit into your pre-pregnancy clothes. Some females may take a couple of months to bounce back into shape while others may need up to a year. Apart from the changes in your body that happen during pregnancy, your body also undergoes changes after the baby is born. These changes can range from change in shoe sizes to belly bulges and they may hinder your fashion sense. What to Wear after Giving Birth? Don’t throw away all the maternity clothes the moment you arrive home after your stay at the hospital. Any pants with elastic waist you wore during pregnancy, which fits beneath the tummy will be essential during the postpartum period. You won’t be able to fit in your old jeans; hence either buy yourself new jeans (a larger size) or wear your maternity jeans during this period. As your body will undergo drastic changes over the next couple of months, it is recommended that you choose denim jeggings that is particularly stretchy. You can also go for yoga pants that are stretchy and comfortable and are available in different colors. If you have a cesarean delivery, they are the best option as they wouldn’t irritate your incision when it’s healing. Another nice option to try is leggings, which you can pair with short dresses or tunics. A pair of maternity leggings or high-waist leggings can work as well. Tunic sweaters are both fashionable and comfortable. They have wide necklines which are feminine and a way to show some skin. Moreover, due to the length of the garment the bulges of hips and belly remain hidden. What to wear after giving birth? You can wear wrap shirts during the post partum period. They do wonders on a female’s body. They are excellent for a post-delivery body as they accentuate curves while at the same time minimizing bulges. Moreover, while wearing them, nursing your baby becomes much easier; hence, they are very functional. 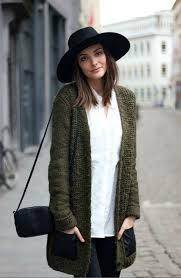 Long cardigans are an excellent staple in every female’s wardrobe. You should add some of these to your post-partum wardrobe to hide your belly bulge. They also help in hiding your leaky and sore breasts during the initial few weeks post pregnancy. Black is always slimming. Similar to cardigan, a short black dress is essential item in every female’s wardrobe. For post-partum formal outings wear a dress that intrigues and conceals. Your post-partum figure will be accentuated by the perfect short black dress while some of the unflattering changes will be hidden. A shift dress (classic) has a deconstructed and youthful silhouette that flatters nearly every woman’s body and particularly a new mom’s. A dress that has spaghetti straps or a scoop neck is especially great option. As a new mom you are now busy taking care of your newborn baby. Hence, you may not have enough time to pick up a perfect wardrobe. However, you can spice up your look by adding some great and chic accessories to your comfy outfit. What to wear after giving birth? Add flair to a monochromic outfit by pairing a colorful scarf with it. Scarf also serves many other purposes- it can become a nursing cover or a blanket for resting in the park or provide shade to your stroller. Wear a wide, big belt on your dress, tunic, jeans or trousers to give a definition to your waist. The belt will also keep your midsection hidden. Wear funky and sparkling bracelets and earrings so that the attention is directed towards your hands and ears and not towards your belly. Your breasts will be sore, swollen and leaky after giving birth and during breastfeeding. You should remember this fact while shopping for new bras and tops. Purchase a sleep bra of good quality (such as Majamas Organic Easy Bra) and wear them during the early weeks. After the size of your breasts settles (usually after a few weeks), purchase a nursing bra. Your feet must have swollen during pregnancy; however, are you aware of the fact that your feet may become large permanently after delivery. While shopping for post pregnancy clothes and accessories measure your new foot size and purchase a new pair of shoes for yourself that fits you perfectly. You can smoothen your post-pregnancy bulges by wearing shapewear underneath your dress. Hence, shapewear is an excellent post-partum wardrobe staple of a female.